Beaver County Peace Links: What Happened to ‘Changing The Mindset’ for Getting into Wars? What Happened to ‘Changing The Mindset’ for Getting into Wars? 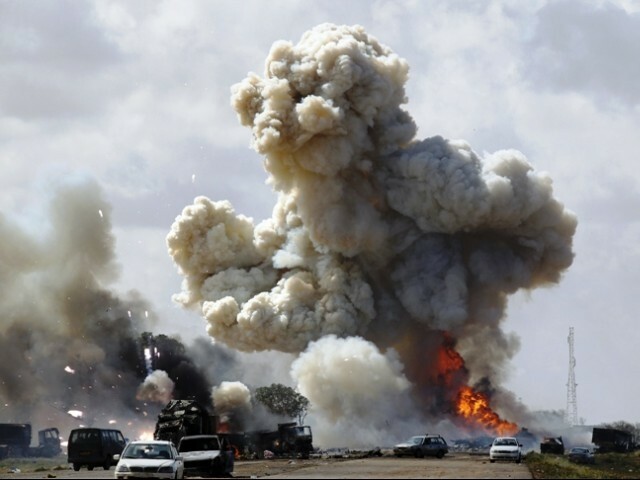 June 16, 2011 - The arguments made to "legalize" war, torture, warrantless spying, and other crimes by John Yoo and Jay Bybee and their gang are looking rational, well-reasoned, and impeccably researched in comparison with Obama's latest "legalization" of the Libya War. "Given the important U.S. interests served by U.S. military operations in Libya and the limited nature, scope and duration of the anticipated actions, the President had constitutional authority, as Commander in Chief and Chief Executive and pursuant to his foreign affairs powers, to direct such limited military operations abroad. The President is of the view that the current U.S. military operations in Libya are consistent with the War Powers Resolution and do not under that law require further congressional authorization, because U.S. military operations are distinct from the kind of 'hostilities' contemplated by the Resolution's 60 day termination provision. U.S. forces are playing a constrained and supporting role in a multinational coalition, whose operations are both legitimated by and limited to the terms of a United Nations Security Council Resolution that authorizes the use of force solely to protect civilians and civilian populated areas under attack or threat of attack and to enforce a no-fly zone and an arms embargo. U.S. operations do not involve sustained fighting or active exchanges of fire with hostile forces, nor do they involve the presence of U.S. ground troops, U.S. casualties or a serious threat thereof, or any significant chance of escalation into a conflict characterized by those factors." Whatever the president's "foreign affairs powers" may be, they do not, under the U.S. Constitution, include the power to launch "military operations" or "hostilities" or "wars." Nor has the distinction between "military operations" that involve what ordinary humans call warfare (blowing up buildings with missiles) and "hostilities" that qualify for regulation under the War Powers Resolution been previously established. This distinction is as crazy as any that have come out of U.S. government lawyers in the past. "It is the purpose of this joint resolution to fulfill the intent of the framers of the Constitution of the United States and insure that the collective judgment of both the Congress and the President will apply to the introduction of United States Armed Forces into hostilities, or into situations where imminent involvement in hostilities is clearly indicated by the circumstances, and to the continued use of such forces in hostilities or in such situations." Anything from imminent involvement in hostilities to hostilities is covered. There doesn't seem to be a gap left through which to exclude bombing people's homes in a non-hostile manner with non-combat troops as part of an overseas contingency operation. Congresswoman Lynn Woolsey remarks: "To say that our aggressive bombing of Libya does not rise to the level of 'hostilities' flies in the face of common sense and is an insult to the intelligence of the American people." "For purposes of this joint resolution, the term 'introduction of United States Armed Forces' includes the assignment of members of such armed forces to command, coordinate, participate in the movement of, or accompany the regular or irregular military forces of any foreign country or government when such military forces are engaged, or there exists an imminent threat that such forces will become engaged, in hostilities." So, the "constrained and supporting role in a multinational coalition" is completely irrelevant, and would be even if it were true that a UN resolution was being adhered to. "If the United States military were to cease its participation in the NATO operation, it would seriously degrade the coalition's ability to execute and sustain its operation designed to protect Libyan civilians and to enforce the no-fly zone and the arms embargo, as authorized under UNSCR 1973. Cessation of U.S. military activities in support of OUP would also significantly increase the level of risk for the remaining Allied and coalition forces conducting the operation, which in turn would likely lead to the withdrawal of participation in the operation." "The anticipated scope and duration of continued United States military involvement in support of NATO activities regarding Libya." The report says the duration is limited, but that merely suggests it's not infinite.